¶ 1 Leave a comment on paragraph 1 0 As the USPOD developed a philatelic relationship with collectors and citizens, the federal government established a postal museum and national collections that encouraged philately and spawned interest in postal matters. In 1894, the USPOD opened a small museum in Washington, D.C. that highlighted the accomplishments of the U.S. postal service. Major museums were opening in American cities by the 1890s, and in Washington the Smithsonian Institution operated the National Museum on the National Mall. The Smithsonian had already established a philatelic collection in 1886, but the Institution did not hold a large postal-related collection until the Department officially transferred all of its holdings to the Institution in 1913.1 Through collecting and exhibiting stamps, stamped matter, and other postal-related articles, the federal government demonstrated to its citizens that these objects possessed national significance. ¶ 2 Leave a comment on paragraph 2 0 John Wanamaker played a leading role, once again, in heightening the profile of the postal service to the citizens it served. Wanamaker was not the first postmaster general to suggest a museum, but he provided the means and support for creating one. Philatelists overwhelmingly supported Wanamaker’s suggestion in 1890 to establish a museum. One philatelic journalist wrote that other stamp-producing nations had opened museums and hoped “that our own country may soon take a leading place among them.” Rather than asking philatelists for assistance, Wanamaker instead looked to local and international postal officials for their help in collecting articles that represented “the progress of our postal system from its inception” that would “illustrate the work of the United States postal service, as well as that of foreign countries.” Stamps would be among many other items on display, including postmarking instruments, mail bags, illustrations of post offices and postal transportation, ship models of mail steamers, and various objects from other postal services.2 Not only would this museum be a place of great interest for Americans, but for philatelists from around the world who might visit Washington, D.C.
¶ 3 Leave a comment on paragraph 3 0 At this time, some philatelists prodded the Smithsonian to collect and display stamps in the National Museum alongside “Indian relics, curios,” coins, and other specimens. The National Philatelic Collection, as it would later be named, began modestly in 1886 with the donation of a few Confederate stamps. Organized with other Civil War-era artifacts, the stamps did not stand out among the other objects displayed in the museum. Spencer Baird, a former Smithsonian Secretary, willed his stamp collection to the institution in 1888, but it was not available for public viewing. Collector Frank Moore felt that philatelists and stamps were “completely left out in the cold by the respected managers of this great institution.” To build a national stamp collection, Moore suggested in 1893 that all collectors send “good stamps” to the museum.3 Even with these donations, stamp presence at the Smithsonian remained small until the two national collections merged in 1913. ¶ 4 Leave a comment on paragraph 4 0 Staged in a renovated storage room in the main USPOD building in Washington, the Department’s exhibitions reused display pieces built for American world’s fairs and expositions. At the museum opening, Postmaster General Bissell bragged that the first exhibits offered a strong base upon which to build a great national postal museum “for the benefit and interest of this and future generations.” Meant for general audiences, not only collectors, this museum highlighted developments in all aspects of postal operations, including transportation, communications, and included a catalog of all stamps printed in the United States (1847-1893). Philatelists enjoyed that the Department had begun collecting stamps from other countries–even “Uncle Sam cannot resist the pleasures of philately.”4 Some philatelists were not satisfied with the state of the USPOD’s stamp collection and thought postal officials should have kept a complete set of U.S. stamps ever printed. They also wanted the USPOD to hire a philatelist to curate the stamp collection. ¶ 6 Leave a comment on paragraph 6 0 Given the high visibility and robust visitation numbers in the 1910s, it is difficult to understand why Postmaster General Frank Hitchcock shut the USPOD’s museum and transferred its holdings to the Smithsonian. Crowding in the main post office building, however, forced Hitchcock to evict the museum, since the USPOD needed the office space. Hitchcock wanted the objects to remain accessible to the public, while also moving visitors out of the main Department offices. Recognizing that the Department was not equipped to properly care for its objects, including the large stamp collection, Hitchcock forfeited the collection in favor of an institution that could. After two years, the collections transferred to the Smithsonian.6 As non-collectors, postal officials did not quite understand the specific philatelic practices of caring for and displaying stamps. Hitchcock, like Wanamaker, believed that the government played a significant role in saving its philatelic and postal history even as it transferred the duties of preserving stamps as artifacts to the National Museum. A federal entity continued to collect stamps and postal-related objects under the auspices of the Smithsonian and not the USPOD—at least for the following two decades. ¶ 8 Leave a comment on paragraph 8 0 This transfer from the Department, the producers of stamps, to the federal entity charged with preservation and diffusion of knowledge, signified a shift in how philatelists and citizens would view stamps once printed. Stamps were not merely physical representations of prepaid postage, they were historically significant artifacts and worth saving. Philatelists believed this from the earliest days of collecting. 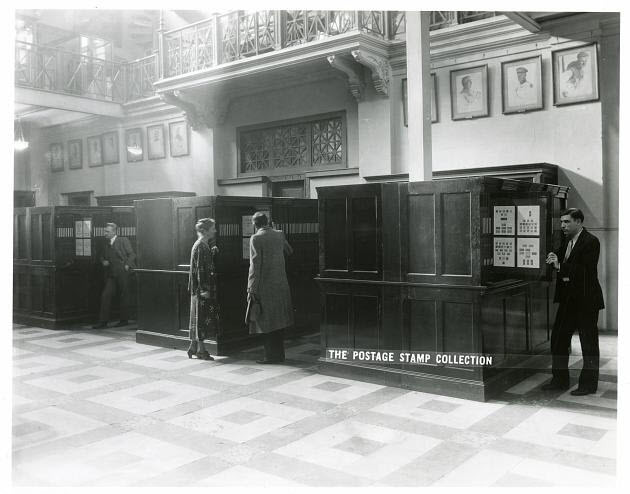 John Wanamaker and other postal officials valued public exhibition space for stamps and postal-related objects in federal buildings for fostering positive public relations. With the Smithsonian in charge, expertise was required for the long-term preservation, exhibition, and interpretation of these historical objects. ¶ 10 Leave a comment on paragraph 10 0 Keeping a philatelist on staff was important when Mr. Leavy left in 1921. Applicants needed philatelic experience, “work as an amateur collector” would not be considered. In the job announcement, the government drew formal distinctions between casual and professional collectors, something philatelists had done for years. Just as Leavy’s personal and professional life revolved around stamps, so would his successor’s. The Smithsonian hired Catherine L. Manning and became known as “Uncle Sam’s First Lady of Philately.” She began collecting when she was a girl and then worked for stamp dealers, including the well-known stamp dealer, J.M. Bartels. Manning’s selection demonstrated that while most philatelic clubs banned female membership, many women collected and studied stamps. By the 1930s, the Philately section of the History Division became well established at the Smithsonian.8 As federal institutions made space in their collections for stamps and postal history, the Department watched the popularity of collecting rise, and they needed a better way to handle requests from collectors.